With a table full of different dishes it is difficult to have space for flowers or any other types of decoration. Now that spring is here it is getting more and more tempting to squeeze a vase full of flowers to decorate our tables. As we were preparing a table for 12 people with my aunt while I was in sunny Greece she suggested I make a Tomato Basket Salad. It’s a very simple idea that shows that with a little bit of imagination simple ingredients can be turned into something unique and stunning. We cut the top part of the tomatoes and with a small spoon we empty the inner part of the tomatoes. We don’t throw the inner part of the tomatoes. We keep it in the fridge or the freezer and use to make tomato sauce. 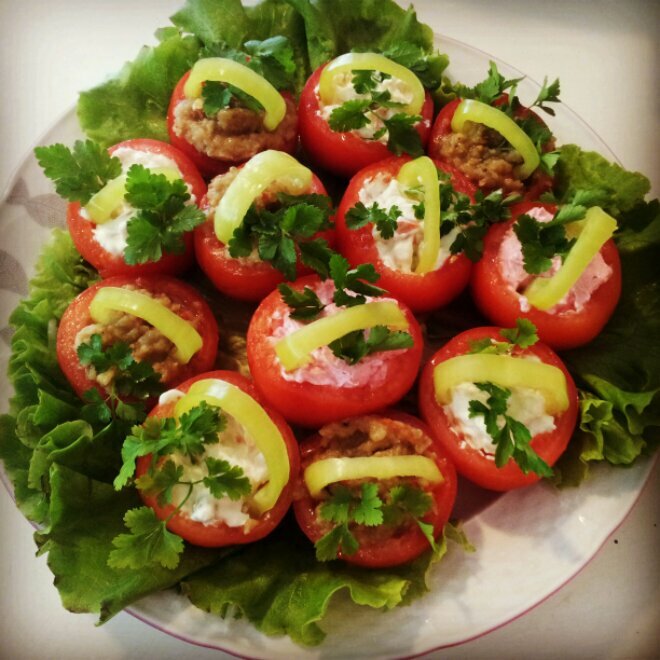 We fill each tomato with a different dip or salad. We slice the peppers and make a cut on one side and use the pepper as a handle for the tomato basket. We decorate each basket with a few parsley leaves. Summer being my favourite season the challenge for me now is to find food styling ideas perfect for the summer!